The link featured today has two interesting ideas from secular scientists, one of which tells biblical creationists something we already knew. First, scientists are suspecting that Earth way back yonder was flat. No, not that way (even though the Flat Earth Society is run by evolutionists). Rather, it was flat in a round way. Uh, let me try that again. You know those maps showing hills, mountains, valleys, and whatnot? Those are relief maps. (Unfortunately, they don't show where I can get relief when I'm taking a long drive, but oh well.) The round, flat earth did not have much relief going for it, not very bumpy, but ocean covered. We knew about that from reading the recent creation account in Genesis, and creationists also believe that the mountains were formed during (and shortly after) the Genesis Flood. The other part of the article is about the faint young sun paradox. No matter where they place it during those billions of Darwin years, it's not the right temperature to sustain life. Some scientists have speculated that solar flares caused life to happen on Earth. Now some owlhoot is thinking that a solar flare caused Earth to happen in the first place. That's not science, old son, it's non-science. 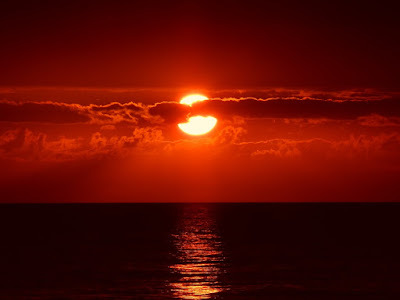 To read about the wet, featureless earth and the solar flare business, click on "Early Earth Was Flat and Ocean-Covered, Secular Scientists Claim".